“M. King Hubbert was a big-name geologist who worked much of his career for Shell oil. Back in the 1970s, when OPEC taught the US that the price of oil was set in global markets, discussions of US energy production often began with the “Hubbert curve,” based on a 1956 paper in which Hubbert predicted with considerable accuracy that US oil production would peak around 1970. The 2019 Economic Report of the President devotes a chapter to energy policy, and offers a reminder what happened with Hubbert’s curve. 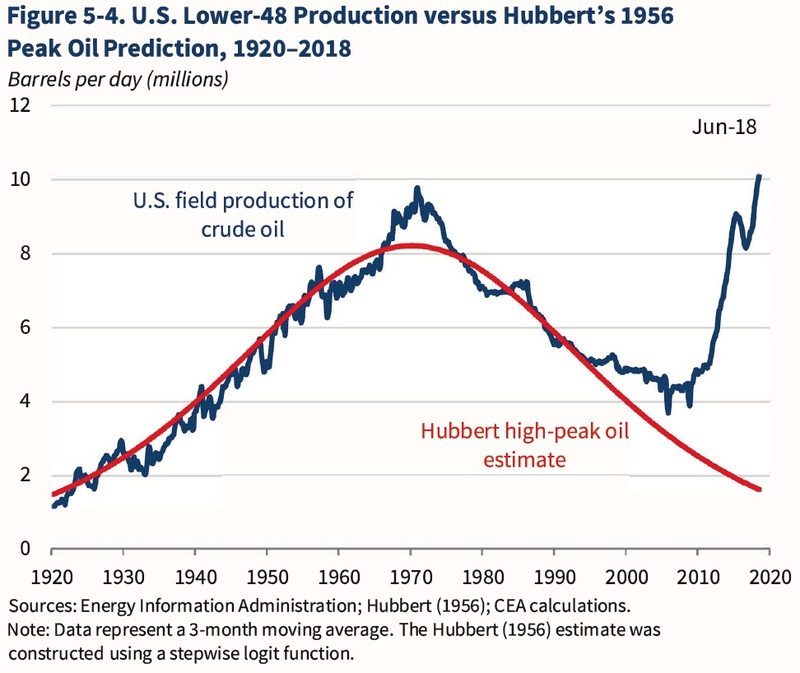 The red line shows Hubbert’s predicted oil production curve from 1956. The blue line shows actual US oil production in the lower 48 states. At the time of Hubbert’s death in 1989, his forecast looked spot-on. Even by around 2010, his forecast looked pretty good. But for those of us who had built up a habit since the 1970s of looking at US oil production relative to Hubbert’s prediction, the last decade has been a dramatic shock.